I'm not sure if this is the correct place to post this, if it is not; please, go ahead and move accordingly. I've been working on a new Casascius tracker tool for the past month or so on my spare time. While it is nowhere near completion, I do feel its at a decent usable and functional place to share with this community and get some feedback. 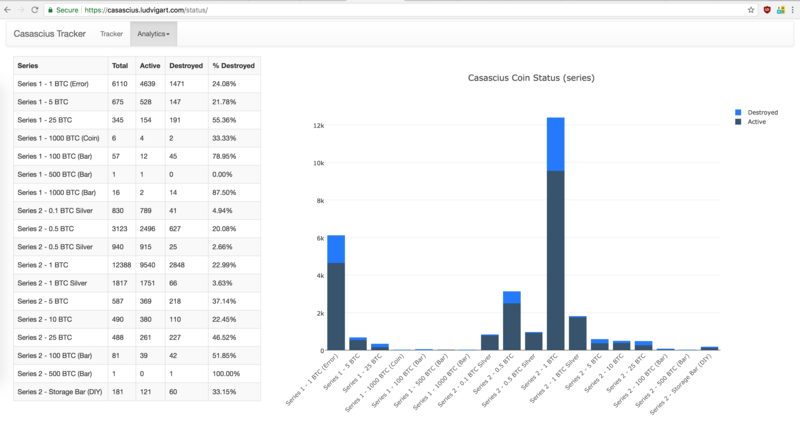 The goal of the tool was to be able to do extensive analysis on Casascius coins, ie. destruction trends, frequency, overall rarity, etc. Please note, that I will be adding more graphs and features in the coming weeks, so do not be alarmed if you see major changes. When I am done refining the tool, I may look into extending the tool to other coins. If there are any suggestions or requests, please include them here. Also, my knowledge of Casascius coins is slightly limited, so I am asking the entire community here for help refine the list further e.g. the infamous double error coins. If you have any information or notice an error in my list, please let me know. Very cool tool to have. Well done! This is a dumb question no doubt but what does 'unused' mean when it comes to these addresses and how they relate to the coins? Are these addresses published by Mike Caldwell at some point? Do you got any idea what the thinking was behind publishing them since those addresses have never been used? Were they on scrapped or unsold coins? Or load your owns? Many of them were used on coins that were given away as "demo" coins to show how they were assembled. They came partially peeled already. I think there were a few coins that were sold unfunded. Casascius did sell a few Gold 2FA 1000 BTC coins that weren’t loaded (Coblee has a bunch). Perhaps some coins were left unfinished but since the addresses were already generated they were published accidentally. I'll get these Addresses added later tonight. I'll also begin working on tagging the HardBTC coins. Edit: After speak with Dazed, I just realized that all of the silver coins produced in 2013 (1Ag) are Series 3. I will also have this correctly tagged. tremendous effort fella, I know how hard you have been working on this. Very nicely done, I especially like the Destruction (https://casascius.ludvigart.com/destruction/) and Status (https://casascius.ludvigart.com/status/) statistics. Thanks for your efforts, great favor for those collecting these rare coins (and getting scarcer every day!). Feel free to take advantage of provided information (https://nastyfans.org/mint.json) for NastyFans Minted Seats. You can contact me with any questions or refer to the existing analyzer (http://analyzer.nastyfans.org) as a reference. Thanks :D Yeah, destroyed refers to redeemed. At least, thats how I view them. If this is not intuitive or may be misleading, we can definitely relabel these. Thanks for this, will do when I am ready to proceed with non-Casascius coins :) The good thing is that the code is modular and extensible so it'll be pretty easy to add other coins with little to no effort :) I just need to get the main one down first. - Correctly tagged Version 3 coins. Please note that some 1BTC Version 3 coins do not start with ^1Ag so it'd be very difficult/impossible to tag them correctly. - Improved the destruction graph by showing overall growth trend over time. Tonight, I plan to break down the Version 2 1 BTC coins by year (2011, 2012, 2013). It should be pretty easy to do. Nothing is set in stone yet. Perhaps, we can debate and make come to a conclusion. I suppose 'Destroyed' carries a bad connotation and I can see people who have redeemed/destroyed Casascius coins be concerned with such rhetoric. Same applies to the other side. Maybe presenting both words appeals to both parties. I also don't want this to turn political though lol :o.
I see. Ding me on TG if you use it 'GrumpyKitty', I can help you with some server side security. It's quite known already, well no wonder. Your analytics look better than this: https://casascius.uberbills.com/. You might want to add something like this too: https://i.imgur.com/GflyLHY.png. I'm just a little bummed that they slightly misquoted me and sensationalized 'terrible security'.